Recently, using Greenwich and Solar Optical Observing Network sunspot group data during the period 1874 – 2006, Javaraiah (Mon. Not. Roy. Astron. Soc. 377, L34, 2007: Paper I), has found that: (1) the sum of the areas of the sunspot groups in 0° – 10° latitude interval of the Sun’s northern hemisphere and in the time-interval of −1.35 year to +2.15 year from the time of the preceding minimum of a solar cycle n correlates well (corr. coeff. r=0.947) with the amplitude (maximum of the smoothed monthly sunspot number) of the next cycle n+1. (2) The sum of the areas of the spot groups in 0° – 10° latitude interval of the southern hemisphere and in the time-interval of 1.0 year to 1.75 year just after the time of the maximum of the cycle n correlates very well (r=0.966) with the amplitude of cycle n+1. Using these relations, (1) and (2), the values 112±13 and 74±10, respectively, were predicted in Paper I for the amplitude of the upcoming cycle 24. Here we found that the north – south asymmetries in the aforementioned area sums have a strong ≈44-year periodicity and from this we can infer that the upcoming cycle 24 will be weaker than cycle 23. In case of (1), the north – south asymmetry in the area sum of a cycle n also has a relationship, say (3), with the amplitude of cycle n+1, which is similar to (1) but more statistically significant (r=0.968) like (2). By using (3) it is possible to predict the amplitude of a cycle with a better accuracy by about 13 years in advance, and we get 103±10 for the amplitude of the upcoming cycle 24. However, we found a similar but a more statistically significant (r=0.983) relationship, say (4), by using the sum of the area sum used in (2) and the north – south difference used in (3). By using (4) it is possible to predict the amplitude of a cycle by about 9 years in advance with a high accuracy and we get 87±7 for the amplitude of cycle 24, which is about 28% less than the amplitude of cycle 23. Our results also indicate that cycle 25 will be stronger than cycle 24. The variations in the mean meridional motions of the spot groups during odd and even numbered cycles suggest that the solar meridional flows may transport magnetic flux across the solar equator and potentially responsible for all the above relationships. 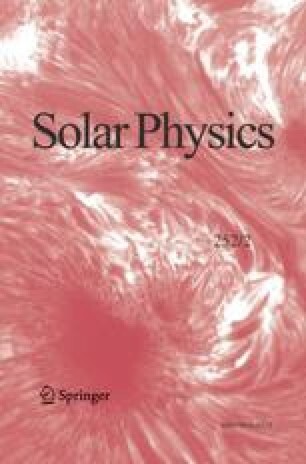 The author did a major part of this work at the Department of Physics and Astronomy, UCLA, 430 Portola Plaza, Los Angeles, CA 90095-1547, USA. An erratum to this article is available at http://dx.doi.org/10.1007/s11207-010-9617-1.